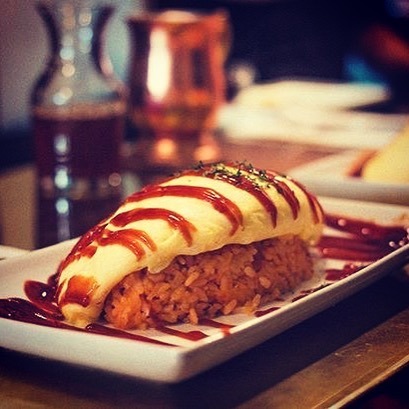 Omurice is a Japanese omelette served with rice and topped with ketchup or a sauce. Its name is a portmanteau of omuretsu (the Japanese pronunciation of omelette) and raisu (the Japanese pronunciation of rice). 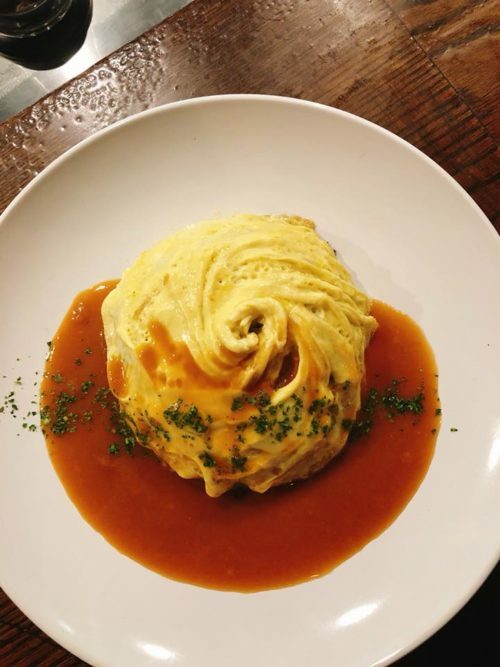 It is pronounced “omu-raisu” in Japan and can also be found on menus as “omelette rice.” It is normally made as a home-cooked meal, or served in Japanese diners. 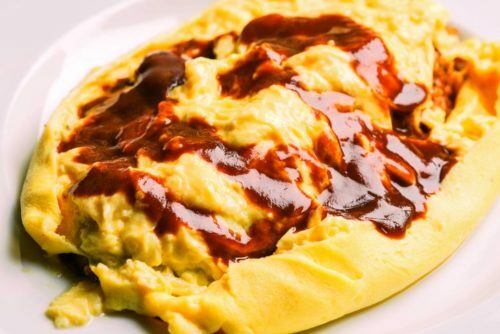 This Japanese rice omelette was invented back in the early 1900’s, but (for the most part) has only been known in Japan and parts of Asia for many decades. Because of it’s popularity in Japan, omurice has even been featured in the 1985 Japanese film, Tampopo, a foodie film which contains a scene in which one of the main characters expertly makes omurice for a child. Omurice is traditionally served with chicken raisu (chicken fried rice), which can be flavored with various vegetables and other ingredients. Although ketchup is most frequently used to top the omurice, a demi-glace beef stock, or white sauce is also commonly used. 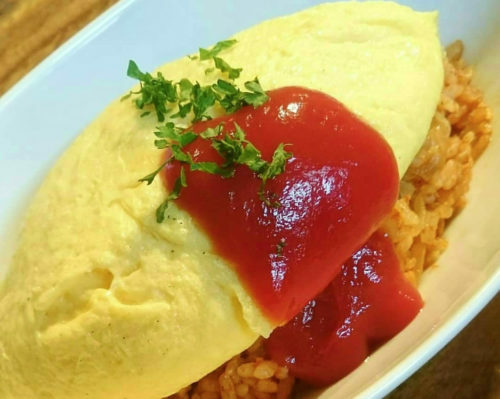 The presentation of omurice varies by establishment. 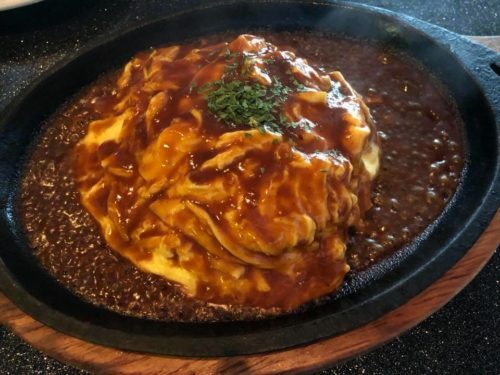 Some places, like Kichi Kitchi (mentioned above), serve it with an enclosed omelette sitting atop a bed of rice making for a theatrical display when the omelette is cut open. Others serve the omelette wrapped completely around the rice. Yet others cook the omelette in a twisted skirt-like shape and place it on the rice. The most basic version, one you might find at someone’s house, is a simple folded omelette on rice. One type of omurice is omusoba. Instead of fried rice, omusoba uses yakisoba noodles. Another type (found in Okinowa), is omutako…which uses taco rice in the place of fried rice. Where can I get omurice? 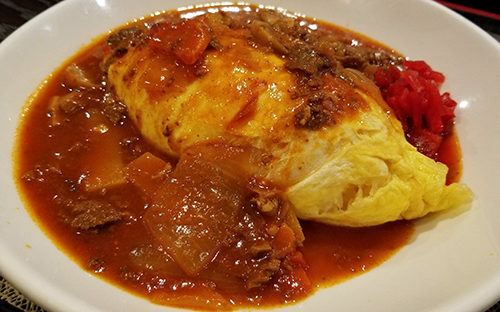 Because omurice is not easy to find outside of Asia, you may want to try making it yourself. Although it might seem intimidating, you can follow this relatively easy recipe. Take note that making omelettes is an art form and most likely won’t come out as perfectly as the one served at Kichikichi on your first attempt. However, as mentioned above, there are several ways to make omurice. So, make it in the way that you feel most comfortable…and like pretty much anything in life, you’ll get better at it with practice. First, make the fried rice. Heat the oil in a pan and cook the onion until lightly browned. Add the chicken to the onion and cook through until no longer pink. Mix in the ketchup and cooked rice. Salt & pepper as you like and set aside. Next, make the omelette. Heat the oil in the frying pan on medium-high. While the oil is heating, beat the eggs in a bowl until color is even throughout. 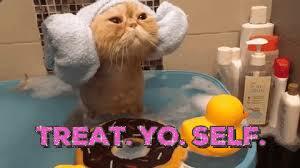 Then add salt & pepper to your liking. Pour the egg mixture in the pan and gently stir with a spatula (or chopsticks, if you want to do things more authentically). When the bottom of the omelette is cooked and the top is slightly runny, fold the omelette in half or thirds so the runny side is on the inside…Or, if you’re more advanced, shape the omelette into a cocoon by flipping it against the side of the pan (see video above at the 1:40 mark). Put the fried rice on a plate. Place the omelette on top of the fried rice and top with ketchup.